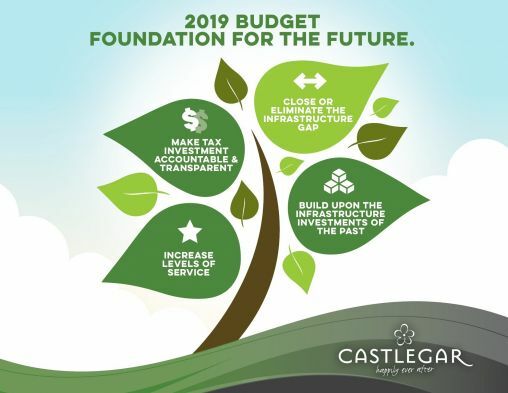 Tonight (Monday) will see city council once again wrangling with the 2019 Castlegar budget as staff return to them with information describing the impact of an aggressive infrastructure plan spread out over either five years or seven. This, after public meetings last Monday and Thursday discussing the operational and capital budgets, respectively. The Thursday meeting, which ran for almost five hours, saw council looking for ways to pare back the proposed budget, which would have seen a roughly 37 per cent increase over five years (city CAO Chris Barlow said a one-per-cent increase translates to roughly $75,000). As council went through the budget items line by line, Mayor Bruno Tassone suggested bumping the $156,000 pavement management plan to 2023, and council voted in favour, while the $50,000 Connecting Neighbourhoods Plan was moved from 2020 to 2021. Much debate centred around a new playground in Millennium Park, which will cost $250,000, but for which the city will receive $187,500 in grant funding. Tassone said the remaining $62,500 was unnecessary, but lost his bid to scrap the playground in a six-to-one vote. He was successful in achieving unanimous votes to have Millennium Park bleachers and bleacher pads removed from the budget, with a combined cost savings of $13,000. There was discussion of removing a $12,000 line item for Christmas decorations, but council unanimously supported Councillor Maria McFaddin’s suggestion that they split the difference and reduce the amount to $6,000. A $10,000 line item to repurpose a rescue vehicle for the fire department was quickly ditched when Fire Chief Sam Lattanzio said the department didn’t need it. Tassone questioned the need for $250,000 for a new loader for Civic Works, arguing that a loader at the airport could be put to work instead. “The public works guys are going to kill me for this, but I feel the loader at the airport will do the job for another two to three years,” he said. “If it doesn’t, I’ll eat my words. Deferring the purchase of a rubber tire excavator until 2021 shaved another $108,000 of the budget for the upcoming two years ($54,000 each year). Councillor Florio Vassilakakis suggested reducing the city’s annual $40,000 contribution to the fire equipment reserve to $20,000, saving $100,000 over five years. The realty dramatic reduction came, though, when Vassilakakis brought up an option outlined in the staff report to council, namely to review previous reserve contribution arrangements. In 2012, the city borrowed from the water reserve to extend water/sewer lines to the city’s airport lands, and Vassilakakis pointed out that not continuing with the payments would save the city $690,000 over three years. Councillor Sue Heaton-Sherstobitoff said she thought the repayment arrangement was likely made to address political concerns at the time, and Barlow said it might make more sense to replenish water reserves through consumption rates rather than via property taxes. Council voted unanimously to cut the line item. Much debate centred around staff bringing back an amended budget proposal including the cuts, with the infrastructure costs and taxation over five years, or whether they should also include a program with the work/expense spread out over seven. “Let them come back with the five-year plan, and maybe we’ll be fine with that,” said Tassone. Councillors Vassilakakis, Heaton-Sherstobitoff and Dan Rye vehemently disagreed. “We owe it to the residents, to our business owners and to industry,” said Heaton-Sherstobitoff, who also asked to see numbers reflecting a higher heavy industry rate, bringing their rate up to 30 per cent from its current 28.66 per cent. Ultimately, council unanimously passed a motion to request staff present both the five-year and the seven-year options – both of which will be presented tonight at council’s regular meeting at the Community Forum at 7 p.m.
During question period, former city councillor Gord Turner praised council’s efforts to find ways to cut the budget. By the end of the meeting at 10:10 p.m., 10 members of the public remained in attendance.